My contract ended on Saturday after (literally) providing a daily column for 18 years for the Tote/Sporting Life/Geegeez. I must have been doing something right to keep the work coming in. Indeed, I was the longest serving freelance writer for the Sporting Life during my 16 year tenure with the company. It’s only right for me to thank Matt Bisogno (geegeez.co.uk) for his loyalty for these last few years. Matt is simply cutting back his editorial team now and we part on the very best of terms. Matt is one of the good guys in racing from my experience and I obviously recommend you continue to visit his site whenever you have some time to spare. 2.15: There has been overnight money for JEANIE’S PLACE and I will add the outsider into the Placepot equation, alongside the likes of HURRICANE ALERT and CAPTAIN RYAN in a race which will not require a great deal of winning. Favourite factor: The inaugural 5/2 joint favourites snared gold and bronze medals before last year’s 8/11 market leader finished out of the ‘short field’ frame. New readers might like to know that the term short field relates to 5/6/7 runner races, in which only the first two horses home qualify from each way and Placepot perspectives. 2.50: The last five winners have carried a minimum burden of 9-2 whereby the bottom two horses are eliminated from my thoughts in this ‘dead eight’ event. Roger Charlton saddled the first winner of the new season at Bath a few weeks ago (his only runner at the track this term to date) and given that his last four runners have won (as have five of his last six), SFUMATO is the first name on the team sheet. Brian Meehan also saddled his only runner at the meeting in this event, with MUTAWAKKED representing the trainer who has won with both of his raiders at Bath this season. Mark Johnson sends just one runner to the track on Monday whereby POET’S SOCIETY will be expected to snare some of the prize money on offer, if only to pay the diesel bill. By the by, if you have never seen the Robin Williams film Dead Poet’s Society, you have missed out on one the very best films ever made about the education system, in my humble opinion. Favourite factor: The last four favourites have snared two gold medals and one of the silver variety whilst claiming Placepot positions. 3.25: Frank The Barber is put in as third favourite in some lists this morning though it’s as well to point out that all six winners to date carried far more weight that the five-year-old has been allotted. Four of the six winners thus far have scored at 28/1-16/1-14/1-10/1 whereby you should ‘keep your powder dry’ from a win perspective from my viewpoint, with yours truly offering Placepot types such as SECRETFACT (unlucky as Windsor last week) FLYING BEAR and POWERFUL DREAM to give us a run for our money. I am invariably suggesting that you should be on your guard against ‘false information’ in this business and a bizarre comment has been posted in the trade press this morning. The ‘expert’ on hand suggests that Swendad likes this course and distance, little wonder considering that his record at Bath is 1/16! Swendab might win who knows, though that is not the point I am making. Favourite factor: Three of the seven market leaders have secured toteplacepot positions thus far, statistics which include one (7/2**) winner thus far. 4.00: ROCK OF ESTONIA and JOE’S SPIRIT will do for me against the field. Lulu Stanford boasts recent stats of 3/5 and will be riding the latter named Michael Bell raider with plenty of confidence. Favourite factor: Last year’s inaugural 5/4 favourite finished well down the field in which horses sent off at 20/1-12/1-14/1 filled the frame, a result which had a great influence of the great Placepot dividend of £2,037.80. 4.35: MORNINGTON and SELLINGALLTHETIME should snare this ‘win only’ race between them. I apologize for the lack of content but my I am having to use my touchscreen to write up these last few races. Favourite factor: Three of the last six favourites have finished in the money, statistics which include two winners via five renewals. 5.10: THE QUARTERJACK won this event back in 2014 and given his three course victories have been gained on good through to soft ground, the forecast rain will be appreciated by the relevant connections. Light drizzle has been falling for much of the night (I live fifteen minutes from the course) and with more forecast throughout the day, the anticipated firm ground might not be in evidence by the time this event is contested. HALLINGHAM is rated as the main threat on this occasion. Favourite factor: Three of the last five market leaders have secured Placepot positions. 2.10: Four-year-olds have won seven of the last 13 renewals (clean sweep 1-2-3 in two of the last eight years - forecast landed two months ago), whilst 11 of the last 13 winners have carried weights of 8-10 or more. If we bring the stats right up to date however, five-year-olds have secured five of the last six renewals, with the two vintages havinbg totally dominated the event down the years. Accordingly, it's difficult to comprehend why only one five-year-old has been declared this time around, with Charlie Hills (JALLOTA) (seemingly) the only trainer to have noticed the 'edge'. Charlie's Rock Of Gibraltar gelding has not won as many races (two in total) as should have been the case, though a draw of 8/14 on Friday could be good enough to take his win/run ratio to 10%. The pick of the four-year-olds will hopefully prove to be ARCHIE (5) and ARNOLD LANE (1), though both of those horses hail from the 'inferior' sector of the weights. SOUND ADVICE (6) is offered up as the overnight reserve, especially as he is unbeaten (via two assignments) at the track. Six favourites have scored during the last 18 years, whilst seven of the 13 favourites have claimed toteplacepot positions via the last eleven renewals. 2.40: Aidan O’Brien has won this Group 3 event five times via the last nine races in which Aidan has been represented, with HOUSESOFPARLIAMENT (drawn 1/8) and COOK ISLANDS (8) having been offered the green light on this occasion. A five length winner in a Dundalk maiden the last day, HOUSESOFPARLIAMENT looks to be the pick of the pair having won over this trip at the third time of asking. That said, Ryan Moore takes the ride aboard COOK ISLANDS and it wouldn't be the first time that Aidan has won a race this side of the Irish Sea with 'the other one'. John Gosden's LINGUISTIC won his latest Newmarket assignment in the style of a progressive horse, with the trainer having described his January foal this time last year as a "grand colt". That said, there is no plan at present to tackle the Epsom Derby despite this being the first of three entries in 'Derby trials', with Royal Ascot's 'KIng Edward' contest being John's thought pattern at the time of writing. Seven market leaders have obliged during the study period, whilst 10 recent market leaders have reached the frame. 12 of the last 14 winners were returned at odds of 8/1 or less. 3.10: Four-year-olds have won five of the last nine renewals (the vintage was not represented on one occasion), with DARTMOUTH, FATHER CHRISTMAS and course winner CYMRO being this year's relevant entries. The trio is listed in order of preference at the overnight stage, albeit oh so marginally. That said, WICKLOW BRAVE is an interesting raider from the Willie Mullins ranks, though you are probably like yours truly in that there are some horses that you just cannot get right (you back them when they lose and they win when you oppose the said beasts), with Wuilliam Buick's mount being one of them! Aidan O'Brien (FATHER CHRISTMAS) has snared three of the last eight contests, though no trainer has won this race more often than Sir Michael Stoute (DARTMOUTH) who has saddled the winner five times, the first of which was with Saddlers' Hall back in 1992. Seven market leaders have rewarded investors during the last 18 years. 15 of the last 17 winners of this event have been returned at 7/2 or less. Five of the ten market leaders during the last decade have claimed Placepot positions though to be entirely fair, many of the favourites lost out when contesting 'win only' events. 3.45: Nine of the last fourteen winners have carried weights of 8-13 or more and the trend could be extended here with three of the nine runners hailing from the ‘superior’ sector of the handicap. The trio are listed in marginal order of preference as KACHY (drawn 3/9), RIFLESCOPE (4) and GRACIOUS JOHN (9). If the handicap trend goes base over apex this time around, EL ASTRONAUTE (1) appeals as the value for money alternative option. The Richard Fahey pair Powerallied and Birdcage were both declared to run on Thursday afternoon, after this analysis for Friday's card was written. Five favourites have won of late, whilst 15 of the last 18 winners scored at 8/1 or less. Nine of the last eighteen market leaders have finished in the frame. 4.20: Four/five/six-year-olds have each secured two victories, whilst five of the six winners have carried weights of 9-3 or more. The weight stats eliminate three runners, four if you include a claiming scenario. The pick of the remaining ten contenders from my viewpoint are THE HOODED CLAW (drawn 6/14), NAVIGATE (9) and DEAUVILLE PRINCE (2). Of those drawn out in the 'car park', MESHARDAL would have entered the mix but for the negative stall position. Four of the six favourites have finished out with the washing thus far (no winners). The average priced winner thus far stands at 8/1. 4.50: If you fancy a tilt at the Placepot on Thursday, you might be influenced by £5,565.50 dividend on this corresponding card back in 2012. This race made all the difference that day, the frame being filled by horses returned at 25/1-28/1-33/1. Three warm favourites won on the Placepot card (11/8-11/10-Evens), whilst five of the six win and placed horses in the other two races were returned at a top price of 15/2, the other position being claimed by a 10/1 chance. My trio against the other five contenders in this nerve jangling 'dead eight' event consists of ANGELIC GUEST (drawn 1/8), GOLDEN GLIMMER (4) and QUEENS CODE (2). The first named pair were only separated by a short head when both horses were making their respective debuts at Haydock, whilst QUEENS CODE could reverse placings with Dufay this time around, the latter named raider having had the advantage of a previous outing when the pair met last month. Eight of the last 15 favourites have won this toteplacepot finale. Six of the last ten market leaders have finished in the frame. I asked you what you wanted last week, and you, dear reader, replied. As a reminder, this is what you said. On the subject of editorial, over 65% of you said you wanted more "thought-provoking articles based on data". So, I am currently pursuing a few lines of enquiry around that request. More immediately, I'm very pleased to welcome back Mal Boyle, author of nine books on placepottery, for a daily placepot data bank. Mal rejoined us on Wednesday, and the latest of his pieces can be found here. On a daily basis, you'll find Mal's posts on the Horse Racing Tips page, and also at the top right of the revised home page layout. Next up, I asked what additional content I could offer to free registered subscribers. The majority vote, in a close run thing, was for the Tracker to be available to all registered users on geegeez. Well, your wish is our command. That's done as of right now. To access Tracker, just click the link in the menu bar. Details on how to use it (it's pretty simple!) can be found from page 46 in the Gold User Manual. But we didn't stop there with our Tracker enhancements. Oh no. A few of you asked for tracked items (horses, trainers, jockeys) to be stored in alphabetical order. Perfectly reasonable request, so that's now done. One thing to say on the subject of the Tracker is that if you're currently using it, your tracked items may have seemed to 'disappear' in the last day or so. Don't worry, they haven't. And the resolution should be very simple. Pressing the F5 key when in Tracker - to refresh the page content - should sort it. If it doesn't, the (only very slightly longer) alternative is to clear your browser cache. Details on how to do that are here. Trainer James Fanshawe has had 67 AW winners from 302 runners at Kempton since 2009. The sum of the odds in decimal [using the equation 1/(Odds+1), for instance 3/1 = 1/(3+1) = ¼ = 0.25] of those 302 runners was 51.9. This has been promoted to the head of our new development list, and it's a list which has plenty of cool new features for Gold users. No estimate for when this will be live yet, but I hope to have a view by the end of the week on that. 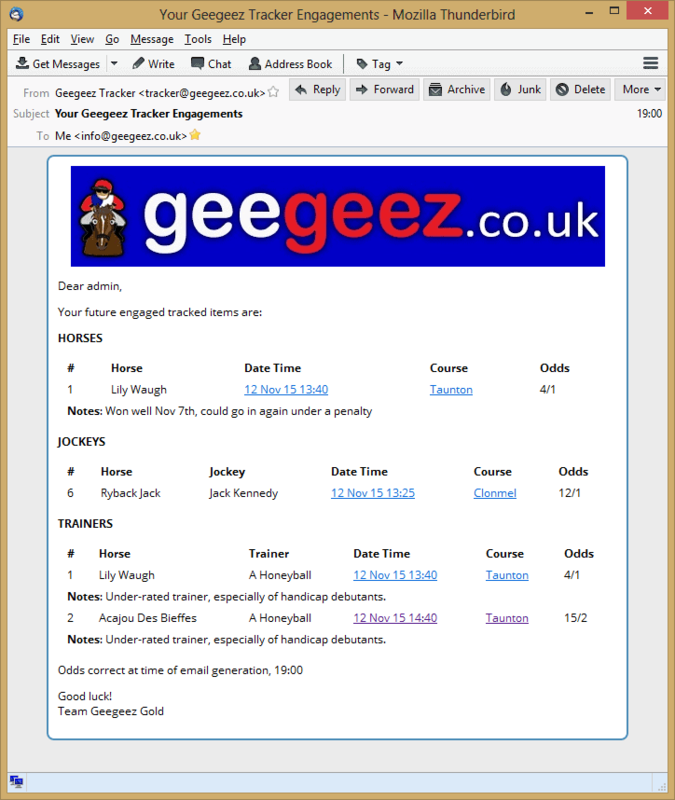 Finally, you may have noticed that geegeez.co.uk is a bit quicker today. And, of course, you may not. Prior to Wednesday of this week, the average home page - which does pull in a LOT of content from various places - load time was almost five seconds. In today's web world, that's a week, and way too long. That's all for this quick upgrade update. As regular readers know, here at geegeez we are committed to continually improving what we offer racing fans, be that editorial, free tools, or premium content. We invest heavily in upgrading our offering as we strive to make this little independent website the very best horse racing and betting portal in Britain. Stick around, there will be more of the same to share soon! p.s. 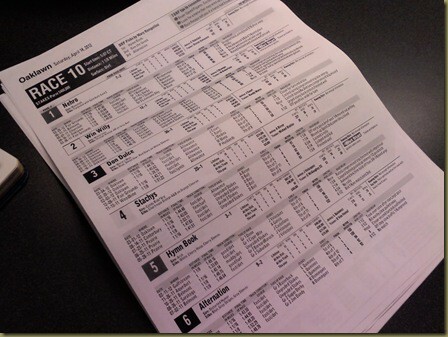 we're also currently working on a complete overhaul of the odds comparison on our racecards. It is the one part of the cards and tools which I don't believe to be A1, and I intend to address that soonest. We'll be checking for odds updates every minute, storing a history of price movements, and introducing more bookmakers - as many as 20 - to the grids. As now, you'll be able to click individual odds to be redirected straight to the bookie in question, or simply click the 'best odds' column for your fancy. I can't wait. 113/124 of the winners (91.1%) started at 12/1 or less.